We are excited to offer on behalf of one of our clients this outstanding 1972 Porsche 911 S Coupe. 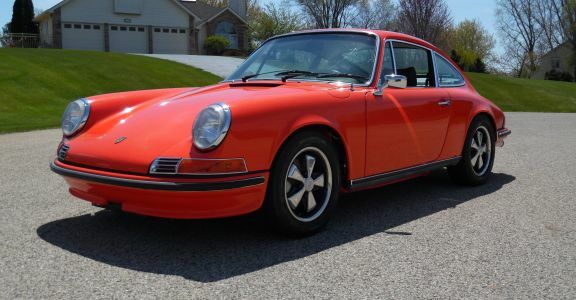 The ‘72 911S is the most desirable of the long hood 911s for many reasons. The 2,4l engine with mechanical fuel injection is putting out a whopping 190hp making it the strongest and fastest early 911 aside from the famous Carrera RS. Further 1972 was the first year for the improved 915 5 speed gearbox and 1972 is the only year with the outside oil filler. This is a fantastic opportunity to acquire a highly collectable early 911S Coupe. Our car on offer comes with an exciting history. Special ordered by Peter Gregg, the famous Brumos Porsche owner, the car was fitted with electric windows, electric sunroof, factory air condition, hounds tooth interior and Sportomatic transmission. Finished in most sought after tangerine, the car is simply gorgeous and one of a kind. After delivery to Peter Gregg, the engine was modified to 2.7l specs. The current owner acquired the car recently and has commissioned a complete engine and transmission rebuild. Suspension and brakes have been gone though as well and the car is mechanically in #1 condition with just a few miles on the fresh engine. Fully sorted vehicle! Visually in stunning condition, this 72 S Coupe is ready to be enjoyed and a perfect car for your next Rally or Touring event!